I nearly titled this post, "Somehow it's Monday." I thought it would be funny--and man, does it feel like a Monday! Let's hope tomorrow doesn't feel like Monday too. First things first. 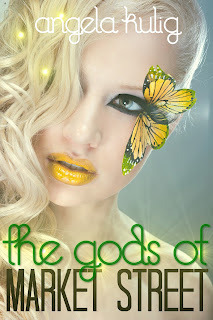 THE GODS OF MARKET STREET has been updated on Juke Pop Serials. Please take a moment to read it, and vote for any chapters you haven't yet! I took a brief break from life (as you noticed if you read this blog) but I plan to update it twice a week from now on. Yet I am sure there will be some hiccups. I wrote the story for the 3 Day Novel Contest last year, so it is written. BUT! If I forget or get lazy just poke me on Twitter. It's an awesome story, and I want everyone to get the chance to check it out. Remember, it's FREE for you to read. Please just pull the lever, and if you have a spare second share it with your friends on facebook, twitter, or hey in real life! You guys have no idea how much you helped me! I am so close to having POMI ready for publication and anxiety is causing me to drag my feet. Speaking of Pigments of My Imagination, I can't even begin to describe what it has done to my nerves. I am a writer, yet I struggle with the words. It's like jumping out of plane and forgetting where the parachute cord is. I know I will find it, but I am going to freak the freak out in the meantime. But it's done. It just needs to be made pretty. Admit it, you want an awesome Twitter Cheerleader button for your blog. A Twitter Cheerleader button sounds rather cool, actually.